Super Mario plumber seems to have a knack for jumping out of the weirdest places. Proving that it isn’t just pipes that he would disappear into and arise from, Mario surfaces from the depths of a delicious looking cake. Super Mario fan art offers us another tasty look at the Mario world with this cake decorated from all angles with the Super Mario character. 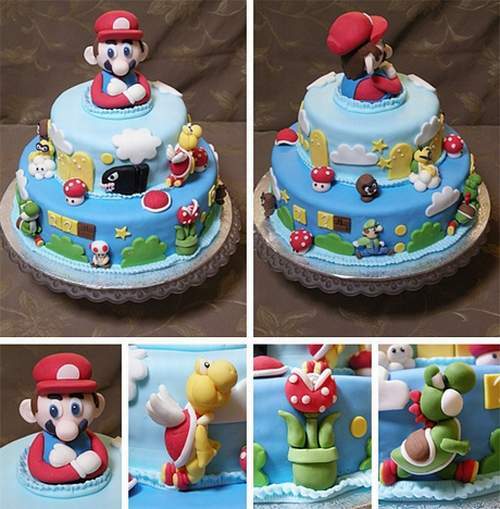 With Mario holding reign on top, the cake features mushrooms, the dangerous piranha plant, scary turtles, and even Mario’s brother, Luigi. An especially cute version of Yoshi can also be seen on the bottom tire. Though piranha plants and turtles are deadly enemies to Mario and Luigi, the cake carries such a festive feeling that any Super Mario Brothers fan could be forgiven for thinking they are all on a fun picnic together. Even the pipe Mario is peeping out from is covered with a healthy dose of icing. If you are thinking of devouring this fun cake, you should also sink your teeth into the Mario Party Cupcake Stand.